Even the “privileged” ones being able to afford big luxurious RVs are becoming more and more “environmentally-conscious”. 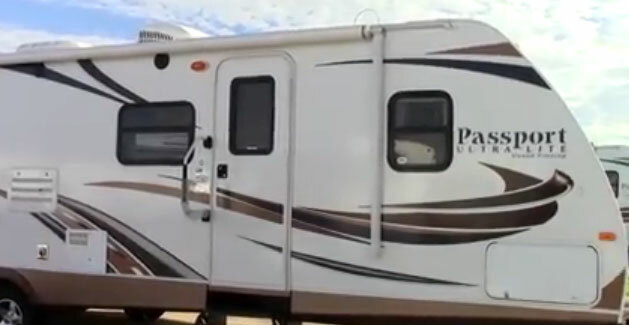 So while looking for large, expensive and well-equipped travel trailers to extend their home-like living conditions when home away, they still look at option of “being lite”. If not consciousness, it’s at least the fashion, the “word-of-the-day”. That is why many manufacturers following this trend designed and rolled-out a range of luxurious travel trailers with reduced weight. It is achieved through careful engineering, use of new materials (aluminum, fiberglass and composites). The result is striking – from the outside these new models are catching eye thanks to elegant lines, stylishness, colors while inside, due to more lavishness and abundance that many wouldn’t easily give up on. On this page we cover our picks for the best lightweight travel trailers weighing under 5,000 pounds. Lance 2295: Try to imagine what is "hidden" inside? The Lance 2295 offers families the luxury of adding a fireplace to their travel trailer; something few other lightweight models allow. 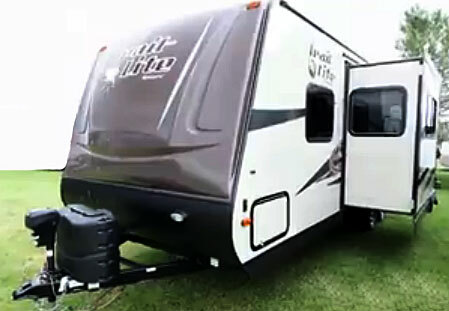 Though it features a large side slide-out that traverses almost the entire length of the trailer, Lance has managed to keep the weight down to 4,185 pounds. This model features a full queen-sized bed tucked into a private bedroom, and a rear bath that has a wardrobe and private dressing space. Entertainment options include a 32' rotating LCD TV. EverGreen is famous for building travel trailers that are lightweight and made from green certified recyclable materials. The 27' model weighs in at only 4,400 pounds, but still offers consumers plenty of choice. EverGreen lets you choose from up to eight floor plans, and their lightweight travel trailers can be configured with a number of slide-out options. You can also add luxury touches such as Corian counter tops, double-door refrigerator, and crown molding throughout the trailer for that extra homey feel. 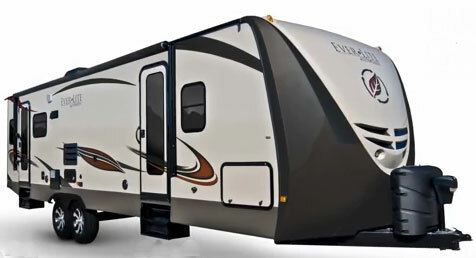 The R-Vision Trail-Lite Sport line of travel trailers offers seven floor-plan options ranging in weight from 3,310 pounds to 4,400 pounds. 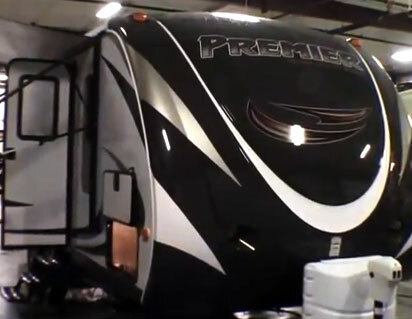 The heaviest model, the 29KBS features a full bedroom in the front with a queen-size bed. A 32” television and radio promises excellent entertainment. The sofa can serve as sleeping space, while a convertible rear dinette and bunk offer even more sleeping opportunities for larger families. This model also features a full tub in the bathroom, as well as a second, larger dinette opposite the galley. The three-burner stove is larger than what you'd expect to see in travel trailer. 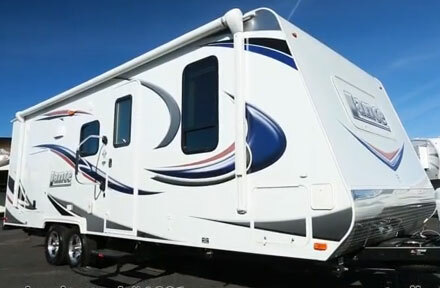 The Keystone RV Bullet Premier 22RBPR model weighs only 4,638 pounds and is extremely roomy inside. This model offers luxury features such as a vaulted ceiling, a swivel LCD TV, large 30 x 36 shower, three-burner stove, and u-shaped dinette. The outdoor kitchen is an added nice touch, as are the electric awnings. The linen closet provides extra storage, and the full bathroom has a very roomy feel. 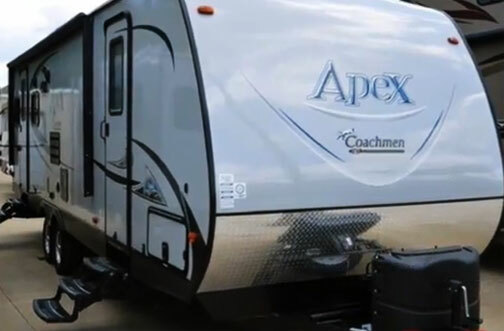 The 2015 Apex Ultra-Lite 235HBS from Coachmen is very spacious, sleeping comfortably up to six adults. Though it weighs only 4,277 pounds (dry weight), this model is loaded with features. The Apex Ultra-Lite contains a full bath complete with tub/shower and a storage wardrobe. In the kitchen you'll find a full refrigerator, microwave oven, and a double bowl sink. The pantry provides extra storage in addition to the overhead cabinets. In the front of the trailer is a full queen size bed flanked by two nightstands, while overhead cabinets plus the wardrobe add even more storage. The rear storage compartment is located below the bunk beds. The Keystone Passport weighs only 4,160 pounds but can sleep up to six adults. This is thanks to the queen beds located at either end of the travel trailer, as well as the couch that can pull out into a double bed. 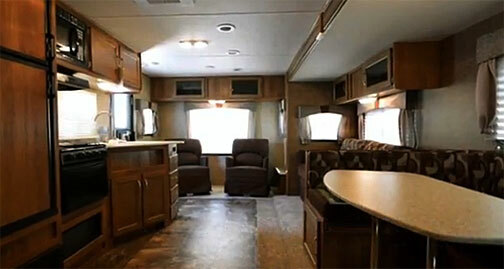 The u-shaped dinette offers trunk storage, while the full bathroom features a shower. Wardrobes in each of the bedrooms offers even more storage for clothing and other items. In the kitchen, you'll find a full refrigerator, three-burner stove, and double sink.